Microsoft has had a record quarter. For the first time in its life as a public company the software giant has reported a quarterly loss. Admittedly that’s not the kind of record you want to be setting, but it’s a record nonetheless. The firm decided to write down the value of advertising player Aquantive, which it gobbled up for $6.3bn in 2007 and it is this that accounts for the $492m loss, the firm said. 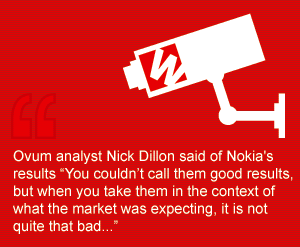 The Informer can’t help but wonder if Microsoft’s performance might also be hampered by the costly interdependency in which it now finds itself with Nokia. Bound by necessity to the Finnish vendor for one last assault on the smartphone market, Microsoft is widely believed to have offered financial assistance to its hardware partner to keep it in the game. Clearly it wasn’t enough. Nokia lost a whopping €1.4bn in the three months to the end of June, almost four times the amount it lost in the same period last year. Sales were down 19 per cent to €7.54bn. CEO Stephen Elop described the quarter as “difficult” with typical Canadian understatement and looked forward to the launch of Windows Phone 8 as “an important catalyst” for the Lumia smartphone range. The firm is lobbing everything it can over the side in a desperate bit to remain afloat, and Elop pointed to the disposal of Vertu, the closure of its German R&D site and the planned closure of its factory in Salo. Job losses on home turf is a touchy issue for Nokia and if the best thing Elop’s spinners could find to say about the Salo closure is that “negotiations are proceeding in a collaborative spirit” then it must be getting pretty gruesome. The Informer wonders if Elop might have tried to cheer himself up by trawling through operator sales portals to see how prominently the Lumia featured. If he went to AT&T’s site on Tuesday he’d have been in for a miserable time as it took about 20 minutes’ of southbound scrolling before the Lumia appeared down among the Pantechs and the unloved, sub-dollar white labels. Above the fold, however, there were three iPhones – two of which were refurbs. People would sooner spend $100 on a second-hand, three year old 3GS than a brand new Lumia 900! The Lumia is now retailing for less than $50 on a two year contract in the US as Nokia toils to drive uptake. It might have a struggle on its hands since the firm has revealed that existing Lumia products will not be software upgradeable to WP8 – and that makes the current batch of products pretty unappealing to the high end user. Ovum analyst Nick Dillon managed to spot a glint of sunlight through all the gloom, which probably says more about Nick’s outlook than Nokia’s. “You couldn’t call them good results, but when you take them in the context of what the market was expecting, it is not quite that bad,” said the kindly Dillon, displaying a bedside manner from which most doctors could learn a thing or two. “The company has managed to double its Lumia sales consistently over the last two quarters now, and they need to keep that momentum going. For Nokia, it’s a case of really having to take it one quarter at a time.” And that, ladies and gentlemen, is the language of recovery. Apple might be scoffing at Nokia but it took a knock of its own this week when it was revealed that a UK judge has ordered the iPhone vendor to take out adverts in a number of high profile publications—and on its own site—announcing that Samsung did not copy the iPad design for its own tablet range. This struck the Informer as hilarious, and Apple has yet to respond to a punishment that must have been deeply satisfying to hand down. The Judge did offer Apple a helping hand with the wording of the adverts by ruling that one of the main reasons why nobody could mistake a Samsung tab for an iPad is that the Samsung products are not as “cool”. UK judges are not renowned for being in touch with any kind of zeitgeist so this particular pronouncement ought not to worry Samsung, but it’s gold dust for Apple. While we’re on the topic of infringement, Research In Motion was this week ordered to pay $147.2m to mobile device management player Mformation. The US Federal District Court of Northern California ruled that RIM’s BlackBerry Enterprise Server (BES) software, which is used by corporate enterprise customers to manage and secure their BlackBerry devices, infringed upon Mformation’s registered designs. You wouldn’t want that kind of news on a good day, let alone while you’re in as much of a mess as RIM is at the moment. For all the punches being taken by the likes of RIM and Nokia, there are still firms game for a shot at the title. This week Chinese vendor ZTE outlined its own desire for that coveted top three slot at a London launch event for its new high end flagship, the Grand X. He Shiyou, EVP of ZTE’s handset unit told the Informer that the firm plans to shift the balance in its portfolio from low – mid to mid – high as a way of closing the gap on Apple. Or the Gapple, as it should be called. This has been tried before, of course, and you don’t see Sony Ericsson in the top three, do you? And it’s not just brand that’s got to be dealt with. It looks as if ZTE might have been a little too focused on handset glory as the firm revealed this week that it expects 1H profit for this year to be down by up to 80 per cent! ZTE said it was feeling the pinch from delays in domestic network tenders, as well as the depreciation of the Euro and loss of income from the disposal of a ten per cent stake in silicon vendor Nationz Technologies. Net income for the first half may now be just $24m. They might be holding off in mainland China, but it’s all go in Hong Kong, where ZTE was in the money, along with Ericsson. China Mobile signed deals this week with both vendors for the provision of its TD-LTE network, which will cover Hong Kong island and the Kowloon region. Ericsson was the sole supplier for the FDD flavour of China Mobile’s LTE network in HK, which switched on earlier this year. The operator also signed a deal with Clearwire this week that will see the two collaborate on roaming services for travellers moving between China and the US. The deal serves as a blueprint for future roaming deals between members of the Global TD-LTE Initiative, which has 48 members. Back to Ericsson, though, which this week showed that the infrastructure market is no friendlier place to be than the handset space. The Swedish market leader reported profits down 63 per cent year on year for the second quarter. The bottom line was SEK1.2bn, compared with SEK3.2bn for Q211 and SEK8.8bn for the first quarter of this year. Sales were flat and profitability was hit by a slow down in the networks division and the tiresome, repetitive and draining influence of ST-Ericsson. It can’t be long before that’s for the hatchet, surely. Global Services held its end up and there was decent growth in the Support Solutions division as Ericsson looks to take establish itself in another market sector. Misery loves company, and Ericsson sank a pint with Alcatel Lucent, which issued a profit warning this week. It’s fine to call them Profit Warnings if you’re warning that you’re profits are going to be smaller, but they should be called Loss Warnings if, like Alcatel Lucent, you’re warning of a loss. The firm reckons it will lose $49m for the quarter, having previously hoped to scrape even. If the word doing the rounds is Truth, then Ericsson and Alcatel Lucent have something else unpleasant in common, which is responsibility for high profile network outages. Alcatel Lucent has already been named and shamed for bring the Orange France network down a couple of weeks back, while there are reports that Ericsson was at fault for O2 UK’s recent collapse. To be clear, though, O2 has yet to confirm what happened. O2 has been busy grovelling to its customers, offering them ten per cent off our next bill and £10 to spend in an O2 shop. So it’s really not offering them anything at all, other than an abject apology. In other UK news, regulator Ofcom released its Communications Market Report this week, which is full of juicy numbers about user behaviour and technology uptake. See some highlights here. O2’s rival Vodafone saw its revenue increase slightly, by one per cent, to reach £10.8bn for the quarter. Group service revenue grew by just 0.6 per cent although group data revenue saw a significant increase of 17.1 per cent, which the firm attributed to an increase of smartphone penetration to 28.7 per cent. Southern Europe carries the can and the worrying reality for Vodafone is that its emerging market investments are no longer balancing the equation. Verizon Wireless was the standout performer for Ovum analyst Emeka Obiodu, which he suggested was ironic given shareholder pressure on Vodafone in recent years to sell the holding over lack of dividends. Verizon Wireless saw a 7.3 per cent year-on-year increase in service revenue for the quarter, an 8.6 per cent increase in retail service revenue, data revenue grew 18.5 per cent and operating income margin stood at 30.8 per cent. It was reported in the UK Sunday Times last week that Verizon is poised to deliver a $4.5bn dividend to Vodafone in the near future, which will certainly please the firm’s shareholders. It’s looking a bit better for the operators than the vendors, but operators as a group were forced to concede a lost battle this week with the dissolution of the Wholesale Applications Community, an alliance bent on the creation of a web runtime environment for device and OS agnostic mobile apps and the wide scale provision of network APIs to developers. Over time the focus shifted more realistically to the issue of opening APIs to developers at scale and in a standardised way. Even in that regard work was slow, although a payment API has been released. WAC will now be folded into the GSMA, while its technical assets will be sold to API specialist Apigee. Despite WAC’s faltering progress, Apigee has pledged to continue both the API exposure and the cross-device mobile app development platform streams of the alliance’s work. It will offer solutions from both projects as managed services to the GSMA and its membership. The operators seem to have finally realised that they’re never going to be Google, much like the Informer finally realised some years ago that he was never going to be Jimi Hendrix. And what a shame it is, on both counts (early death aside). Operators would love to be Google because Google is filthy, stinking rich. The firm bagged profits of $2.79bn for the quarter, and saw revenues grow 24 per cent to $12.21bn. Motorola contributed $1.25bn of that, with $843m from devices and $41m from the home segment, and the handset vendor managed an operating loss of $38m. One thing that Google doesn’t have that Yahoo! has is Marissa Mayer. Mayer, who was Google’s first female engineer, and spent 13 years at the company, finishing up as VP of local maps and locations, is to be the new CEO at Yahoo!. At 37 she’s the youngest CEO of a Fortune 500 company. She’s also six months pregnant with her first child. Mayer said she would take two weeks’ maternity leave and would work throughout that fortnight anyway. This made the Informer – who has a six month old baby at home – laugh long and hard. Then he saw that Mayer’s package could be in the region of $70m and he realised that Mayer’s nanny will probably have a nanny. There’ll be no need for the Informer to send any nearly new baby clothes, will there.